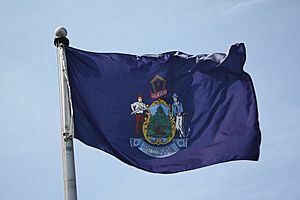 The flag of the state of Maine features the state coat of arms on a blue field. In the center of the shield, a moose rests under a tall pine tree. A farmer and seaman represent the traditional reliance on agriculture and the sea by the state. The North Star represents the state motto: Dirigo ("I Lead"). There are no official colors for the coat of arms, so variations in coloration can be seen in flags from different manufacturers. The blue field, however, is specified to be the same blue as in the flag of the United States. According to the official description, the flag should have a fringe of yellow silk and should have a blue and white silk cord attached at the spearhead. These embellishments are very rarely observed. The North American Vexillological Association conducted a survey in 2001 that ranked Maine's current flag as one of the worst in design. Amongst the 72 U.S. state, U.S. territorial and Canadian provincial flags, Maine's flag ranked 60th (13th worst). NAVA criticized the unoriginality of "[state] seal on blue bed-sheet" design, which is currently used by almost half of the flags of U.S. states. Originally, the state flag consisted of a green pine tree, symbol of New England in the center, with a blue "North Star", all on a buff-colored background. The image to the right contains a digital reproduction of the 1901 Flag. 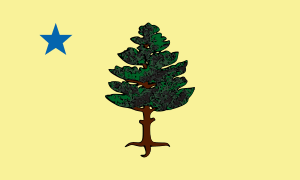 The reproduction uses the same pine tree used in the Merchant Marine Flag of Maine. Also, the size of the tree, set to 1/3 the fly and 2/3 the hoist, is guesswork. The Maine legislature approved the current flag on February 23, 1909. Maine is also one of only two states with a separate ensign, which is rarely seen (the other is Massachusetts). It features symbols from the current flag and the older one, with a white field and green pine tree. 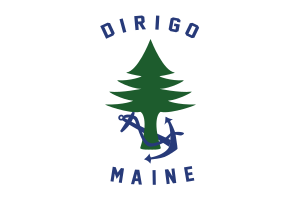 The green pine tree has the seaman's anchor, and the words "MAINE" and "DIRIGO" around it. 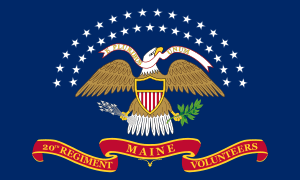 The flag used by the 20th Maine Volunteer Infantry Regiment during the American Civil War. Flag of Maine Facts for Kids. Kiddle Encyclopedia.